We had our first ever brain-tanning workshop this weekend and it was a great success. 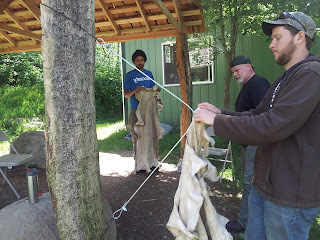 We turned soggy, wet, stinky deer skins into beautiful, soft, fluffy buckskin! Brain-tanning is a lot of work but it is a relatively simple process. All you have to do is scrape the skin clean, remove the "grain" layer (the layer of skin that the hair grows out of) and impregnate the hide with an emulsified oil solution (an oil solution that mixes evenly with water - like milk). Brains were used all over the world for this process because it makes an excellent emulsified oil and conveniently, most animals have enough brains to tan their own hide. We used food grade pork brains from a local market. As the hide dries it needs to be stretched and softened and if everything goes well, it will dry into buckskin. 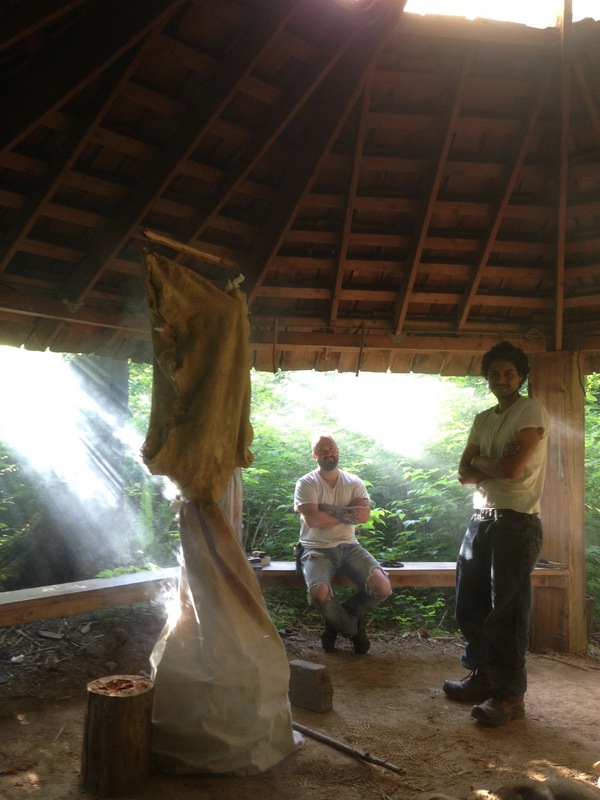 The final step is to "smoke" the hide. This preserves the skin and helps it stay soft even if it gets wet again. Here the students are working away scraping off the hair and grain layer. Lots of work but fun too! Here we are softening the hides using a cable. It seems simple but it is really a fine art. Smoking our hides in the Outdoor Classroom.